Card: Star Pics 1992, SkyBox 1992, GameDay 1992, ProSet 1992. John “Bucky” Richardson was a scrappy quarterback from Texas A&M in the dying days of the Southwestern Conference who did almost as much damage with his legs as he did with his passing arm. He finished his career as the SWC All-time leading rusher for quarterbacks with 2095 yards, and just had a knack for winning, finishing with a 24-6-1 record, 2 SWC Championships and 2 bowl games victories, in the Cotton and the Holiday Bowl. 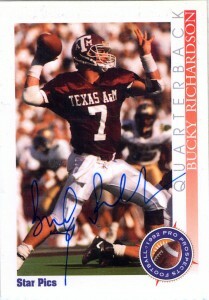 An immediate fan favorite due to the proximity of A&M, Richardson unseated Houston 3rd string quarterback Reggie Slack for the position and rode the bench squarely behind Warren Moon and Cody Carlson. 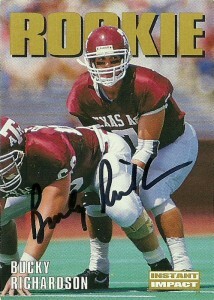 Bucky was a great athlete and with a ‘do it all’ mentality, even contributing on special teams for the Oilers. At training camp demand for his autograph even rivaled that of Warren Moon, but I would manage to get his autograph on this really nice Star Pics 1992 card. After the Oilers collapsed again the playoffs in 1993, owner Bud Adams made good on his threats and dismantled the Oilers, starting by trading quarterback Warren Moon to Minnesota. With Moon gone, Carlson was the defacto starter to begin the 1994 season, but fans began clamoring for Richardson during the preseason after his memorable last second Herculaneum heroics against the Dallas Cowboys. Carlson’s career in the meantime took a bad turn and injuries sidelined him for the majority of the season, leaving the starting job firmly in the hands of 3rd year pro Richardson. While fans were overjoyed hoping to see the same heroics from Bucky that they had seen during the preseason, he would not be given any luxury to learn on the job as the team completely collapsed. He’d step in throw for 203 yards and 3 touchdowns in an opening loss to the Colts, but after misfires in the following weeks, Carlson stepped back in only briefly, before Richardson would split time with Billy Joe Tolliver for the remainder of 1994. Although Richardson was good as a change of pace quarterback, he finished with a 1-3 record as a starter for the team- with his lone victory coming in the 24-10 season finale win over the New York Jets. With Jeff Fisher now in place as the Oilers coach, Richardson was allowed to leave via free agency at the conclusion of the season. 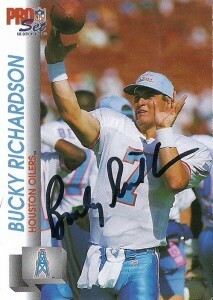 The Dallas Cowboys signed Richardson in 1995, converting him to fullback but he would not see any playing time. He’d be on the move again in 1996 as Bucky signed with the Chiefs, ironically beating the Cowboys again in the preseason at quarterback. He’d finish his career sitting on the bench in Kansas City. Since football Bucky has retired to Houston where he’s still remembered fondly by the A&M faithful for his playing days in the SWC. He also runs a water treatment facility and coaches little league football. I sent off for the Skybox, ProSet, and GameDay autographs last month, and received a response in under 10 days. The GameDay card is an odd card with 4 players occupying the image. 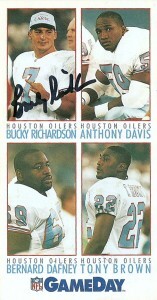 Of note this is probably the only card that exists for the trio of Davis, Dafney or Brown in their Oilers uniforms. Unfortunately none of them made the squad and Dafney and Davis would become journeymen, respectively at their positions. The ProSet 1992 Series 2 card is quite garish. Bad design, bad logo change, and don’t you think they could’ve gotten a photo of Bucky with his helmet on in action? -Unfortunately this is when ProSet really started cutting corners. This Skybox one though is really nice, even though they sacrifice promoting the company on the card front. Exceptional framing, especially with Bucky silhouetted against the word “ROOKIE”. By far my favorite of the group, outside of the Star Pics offering.